Acquired from an Estate in New Orleans, Louisiana; these are mint condition, matching RETRO style RING and PENDANT. We are advised these are 22k yellow gold, and preliminary testing has confirmed them to be in excess of 18k. Gloriously bold, and stunningly beautiful, the rich, golden tea colored Citrine in this ring measures roughly 1 3/4" long by 1 1/2" wide. It is estimated to be in excess of 50ct. The ring size is 6. Note the extraordinarily intricate etching and scrollwork. Ring & pendant, together - $1995. THE ERA: RETRO (1935-1955). This era represented an infusion of old and new -- melding the curves of Art Nouveau with the clean simple look of Art Deco, but in a scale not seen before. Big is definitely beautiful when it comes to describing the fine jewelry of the Retro period. Large scale, stylized geometric forms were absolutely the rage. THE GEMSTONES: A gemstone is the naturally occurring crystalline form of a mineral which is desirable for its beauty, valuable in its rarity, and durable enough to be enjoyed for generations. There are more than 30 popular gem varieties and many more rare collector gemstones. Some gemstone varieties also come in a range of colors. Among the quartz family of gemstones you may already be familiar with are; amethyst, citrine, rose quartz, smoky quartz, and onyx. 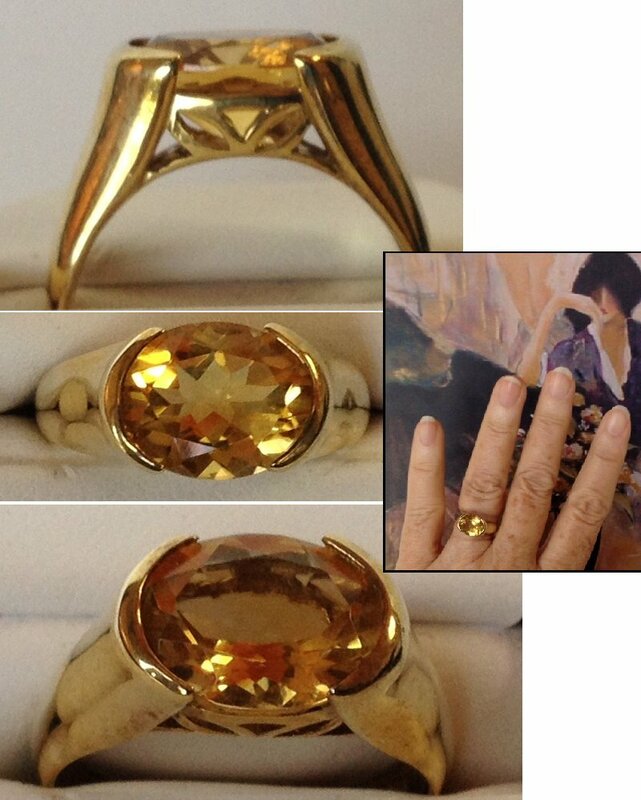 The gemstone Citrine, (pronounced see treen) takes its name from the old French word for lemon, citrin. Citrine is quartz crystal, a semiprecious gem, resembling topaz. Citrine is actually somewhat rare in nature. Many of the natural citrines may have started out as amethyst, but heat from nearby magmatic bodies caused the change to citrine. Along with the orange-yellow citrine, is the dark, orange-red to vivid pumpkin Madeira citrine both of which are found worldwide. The Champagne citrine, a brownish-yellow stone, and the lemon yellow, actually a greenish-yellow, are mined in Brazil. Citrine was popular in the Late Victorian era, and was often set with other semiprecious stones, such as bloodstones, carnelian & garnets. The term Golden Quartz also denotes the richer, deeper, tea-colored variety of Citrines.